When Bronx-born Adrienne Malave grips her mic, she immediately transforms into the femme fatale Mala Reignz. Standing tall at 4 feet 11 inches, the petite powerhouse spits lyrics with the ferocity of a giant. Beginning as a slam poet, Mala’s gift of phenomenal wordplay was immediately embraced by the New York City poetry circuit. With Hip-Hop in her heart and rhythm running through her veins, it was evident that she was destined for the title of FeMC. Once Mala Reignz stepped to the platform, her raw talent was recognized by anyone who witnessed it. Her ability to speak the truth about life, love, and womanhood, while at the same time verbally destroying any contender, is a gift that very few MCs have. She’s honed her skills for years and is now geared to become a household name. MCs beware! Mala Reignz will not lose! 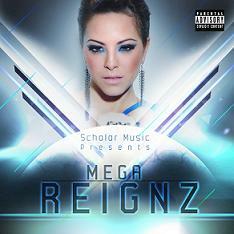 Download “MEGA REIGNZ” The Mix Tape by clicking HERE! Pretty Lou: Amongst the sea of talented artists, in the bustling metropolis, is a Pop Princess hailing from Hollis, Queens… Asia Violet. The city’s culture breeds strong competition, which is second to none and takes more than just talent to be amongst the successful elite. Asia Violet has made a distinct impact on the industry and demands everyone’s attention. With an outgoing personality, winning smile and serious attitude, this soon to be pop phenom has honed her skills as a well-rounded multi-talented artist and performer from a very young age. With dance as her first love, Violet has also added singer, actor and model to her repertoire. This Pop Princess will prove to be a force to be reckoned with. Stay tuned for the year of Asia Violet! Pretty Lou: B.Smyth is one of the new talents co-signed by NeYo and the Motown Records offices. The viral sensation that once prided singing covers of new songs and freestyle Hip-Hop dancing, is the next big thing in R&B. Releasing his first major music video production today, B.Smyth screams “LEGGO” to the world, wings ready to fly. Featuring grammy nominated rap star 2 Chainz mid-way into the new song, the radio is going to play this faithfully. Top 40 charts can expect this to rise into a ‘hot’ position in coming weeks. Independent radio stations can expect girls to flood their call-in lines with requests. Pretty Lou: E.N.Y The Artist is by far the most versatile, charismatic and entertaining up and coming young hip-hop artist in recent years. Born in the Jackson Heights section of Queens and Raised in the mid 90s E.N.Y The Artist witnessed first hand the evolution of hip-hop. ”I knew every word to every song on “Ready To Die” I studied that album beginning to end!” he said. Inspired by such artists as Jay-z, Eminem, Notorious B.I.G. and the late great Big Punisher E.N.Y The Artist began his journey on becoming an established artist. Now with his journey almost at its pinnacle state E.N.Y The Artist Is creating a new brand of hip-hop he calls “Top Down Muzik” which consists of intense and almost hypnotic rhythmic sounds mixed in with stadium ballad like choruses and a rapid yet smooth rhyme delivery. E.N.Y The Artist’s most recent release Titled “#NOSLEEPTILPLATINUM” hosted By The Heavy HitterDJ Camilo of HOT 97 FM. Has generated significant buzz within the NewYork Independent HipHop scene. E.N.Y The Artist’s Debut single “Everythin New York” feat. H Mc. Cloud Debuted March 20th 2012 On SiriusXM Radio (Shade45) got raved reviews and has been on rotation on many different Online Radio Stations. E.N.Y The Artist is the definition of what it meansto bring something new to the table and is an all around great entertainer. From his electric performances to his Larger than life TV and Radio interviews E.N.Y The Artist brings back the element of excitement to the hip-hop industry.